When the world is spinning around me, when I want to pull my hair out with to many "To-Do's", when it feels like I'm being smashed together by the demands of my world, I try to get up 30-60 minutes earlier. Why would I sacrifice sleep when I feel pressure from all sides of my being? Well, it's because those tiny moments of the morning when the world is still, they are when I can best listen to myself, when I can get in touch with what I really need and want. 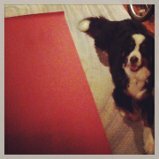 This morning I woke up early and got on my mat for a short personal practice in dim candle light. Did you know that doing something small and special for your self like 10 sun salutations with a candle lit can help improve your mood? It can immensely! After my sun salutations it was time for a hearty healthy breakfast, poached eggs on a piece of toast with provolone and a strong cup of coffee. I took the time to finish my morning pages and not let myself feel rushed. This small practice, hearty breakfast and morning pages allowed me to start my day feeling centered. It allowed me to feel like I was moving forward from a place of peace and not rush around like a crazy woman. My morning at work was productive and lead with focus because I was grounded and able to focus on the goals of work. It's lunch time now and I'm giving my brain a break, a rest from work instead of working through, well, I'll probably only take a half an hour but that's better than nothing. I truly believe that (and research backs me up) giving your brain a rest makes you more productive, not less. How will you carve out time for yourself? December is filled with hustle, bustle, year-end activities, goals and seasonal festivities. Much to do, but that doesn't mean you can't be grounded, it doesn't mean you can't carve out time for yourself. You will actually function better if you do. Looking forward to hearing how you find time amidst the holiday and year-end bustle to take care of yourself. It's 8:24pm on a monday night and I've just gotten done with a short meditation practice. I know I've got an early morning start tomorrow, but the evening breeze is coming in my bedroom window after a cool rain. I'm not quite ready for bed. A piece is missing. My home practice. I get up, unroll my mat and set it up in the empty room I practice in. It's not pretty, my mat is dirty it's been well-loved and no matter how many times I wipe it down with tea tree oil, it still feels grimy to me. Never mind that, I go change tops to make sure my t-shirt doesn't fall down and distract me. I've got too many distractions in my mind already I want to mitigate the ones in the body. When I come back to my mat Max is lying down next to it, at least he isn't on it. I'll choose my battles and I let him be. I think when I do yoga it seems to give him a sense of calm and security, but then again I could be imagining that. My teacher Stephanie said we should lock dogs and children out of our practice space/time. I do understand why, but max doesn't want to bother me, he just wants to be near me. I'm on my mat to practice that's all that matters. I'm getting back to a steady home practice these days. No, I don't spend 3 hours a day on the mat like some teachers I know and admire, but I do make it a point to get on my mat for a few minutes each day even if I can only spare 10 minutes. I need the time to listen to my body, I need the time to check in. It's not pretty, I get distracted, I try to remind myself like I remind my students to stop thinking about the lint between my toes, the chipped toe-nail paint, the dust bunnies in the corner and the list of things I failed to do at work and just breath. The point is to notice the distractions, acknowledge them and let them go. Listen to my body, what's tight, what's not, what's going on in the body, what's coming up in the mind. Notice and let go. The point is that if we don't show up on our mats to find out, we'll never know. We need to be home to answer the door. That's why I head to my mat. I want to be present for whatever knocks. What ever calls at my spirit. To do that we need to put in the work. We need to show up so I show up.